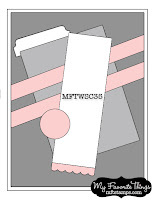 It's hump day and time for MFT's Wednesday Sketch Challenge! This week we have more tilted panels! I went with a Pure Innocence image and colored it with Copics. I don't have the file tab Die-namic dies, so used a SU Curly Label punch and cut off one side. 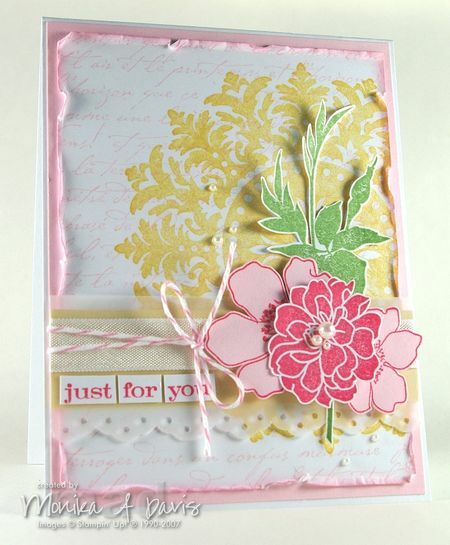 ACCESSORIES: Curly label punch, Resin flower, Prima, Button, Copics, Rhinestones, Border Die-Namic by MFT. Karen Barber is the SCS Color Challenge hostess with the "mostest" daring combo I've tackled in a long time - Cherry Cobbler, More Mustard, Calypso Coral! I guess that's why they're called challenges - lol! The dessert option was to create your own DP, so I went with some leaves as I thought the colors were a bit "fallish". When I left work late last night, the air had a real nip to it...which I really love...but it reminded me again that summer is winding down fast! 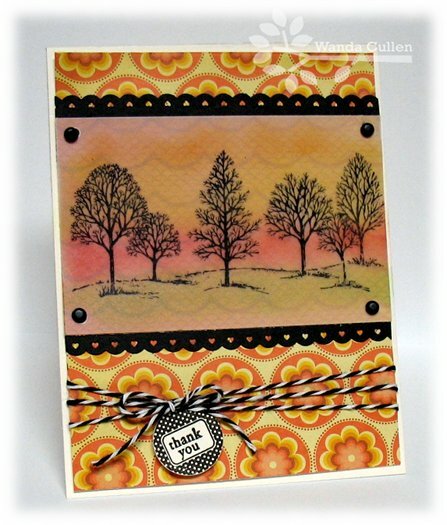 I stamped off once before stamping the BG of the leaves. Hope you're having a great Tuesday and don't forget to comment on THIS POST for a chance to win blog candy! I'll be announcing the winner on Thursday! ACCESSORIES: Arrow brad by Spare Parts, Plaid EF by Sizzix. 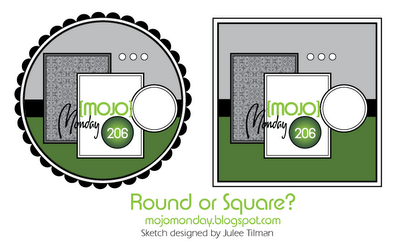 I'm feeling some jet lag from the busy w/e, but had to play with this super sketch for the Mojo Monday challenge! I went with the round version and since I already had this DP on my desk from an earlier project, I went with it again. Michael's has a lot of new inventory and I discovered they have tons of colors in these paper flowers (can't let those coupons go to waste ya know - lol!). Love the new sprig die, so tucked a couple on the card! Gotta get ready for work, so will sign off quickly! ACCESSORIES: Doily lace & Circle Nesties, Corner chomper, Tag die (Verve), Paper flower by Recollections, Sprig die (Verve), Baker's twine. 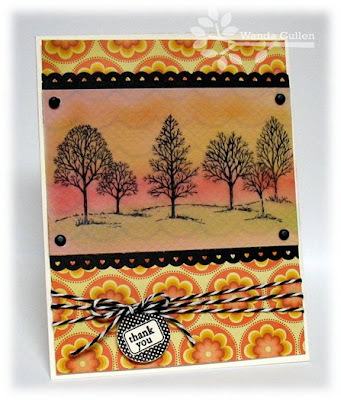 No cards to post today...BUT...I have been stamping up a storm while it was raining all day courtesy of Hurricane Irene! 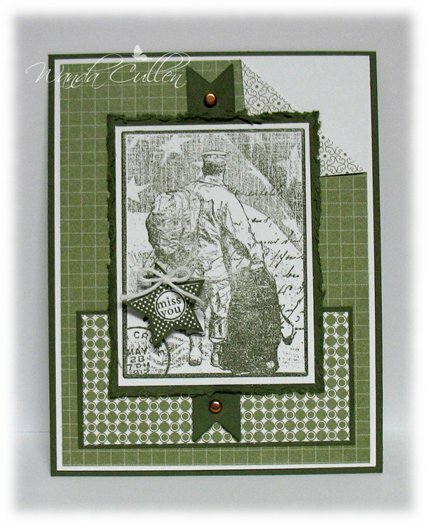 I made 3 cards for the Dirty Dozen challenge in September and it's time to call it a day! Don't forget to comment on THIS POST if you want a chance to win 5 paper pads from My Mind's Eye! We're heading to Washington DC in the morning to help our son and DIL move to their apartment...good night all! 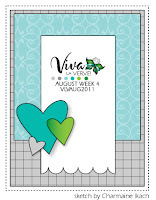 Teresa Kline has a super sketch on the Viva la Verve challenge...the 5th and last layout for August! It was perfect to use some of my new Verve images from the latest release. This is also for the Free 4 All challenge on SCS to "stack it up". I stacked the flower and the tag with 3 layers on each element. The seam binding was hand dyed using Tattered Angels glimmer mist sprayed on white seam binding. ACCESSORIES: Circle Nestie, Small & large tag dies by Verve, Baker's twine, Seam binding, Button, Ribbon, MS tiny heart border punch. 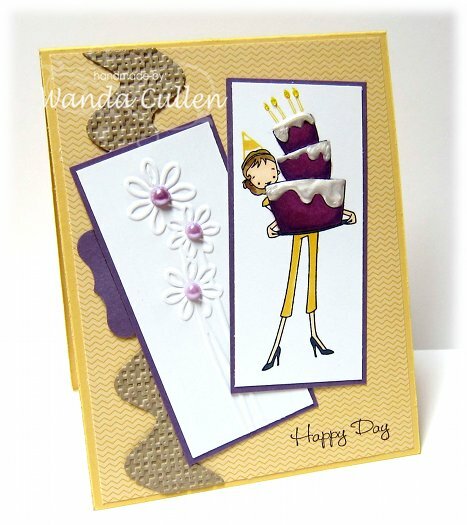 This card is for the Color Throwdown challenge to use Perfect Plum, So Saffron & Crumb Cake and also for MFT's Wednesday Sketch challenge. With the 2 narrow panels, I immediately went for an ala mode stamp. The image was colored with Copics and yellow Stickles were added to the candle flames; Liquid Pearls was added to give a dimensional look to the icing. I ran the rickrack border through the Big Shot using the square lattice EF. Not sure how I feel about this one...I think my mojo fell through the crack during our Tuesday afternoon earthquake - lol! ACCESSORIES: Curly Label punch (SU), Border EF, Pearls, Copics, Yellow Stickles, Liquid Pearls. This week Joni has a color challenge on the Raise the Bar challenge blog - blue, red, green! Hop on over and see the rest of the bartenders' samples and join in the fun! I went with a navy shade of blue and love using a pop of red with this color! 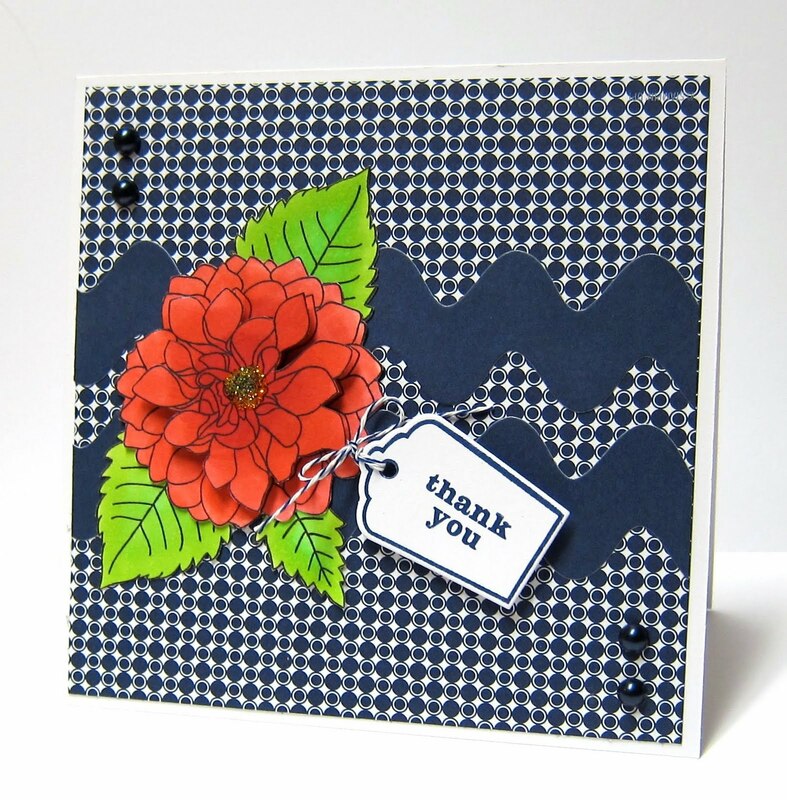 The dahlia was colored with Copics, cut out and the 2 layers were popped w/foam dots. A couple of rickrack borders, a new Verve die tag and this was a quick and easy card to complete. ACCESSORIES: Rickrack Die-Namic (PTI), Little tag die by Verve, Baker's twine, Copics, Yellow Stickles, Navy pearls. 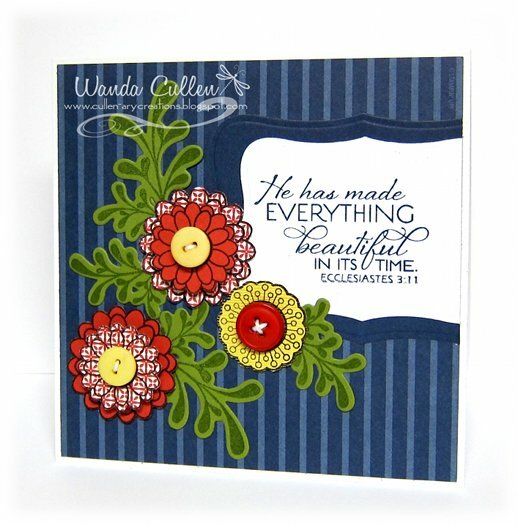 Julia Aston has some fun primary colors for the SCS Color Challenge this week: Night of Navy, Real Red & Daffodil Delight! The dessert option was to use a back to school theme, but I don't have any school-related stamps so had to skip dessert. 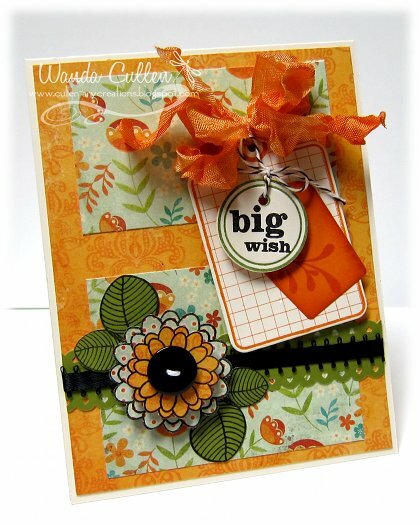 The flowers are new images from Julee's last Verve release and they were fun to cut out and pop with foam dots. 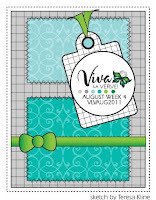 ACCESSORIES: Labels Eight Nestabilities, Vintage buttons (PTI), Sprig die by Verve. This is my second card for today...still trying to catch up and this time it's for Charmaine's great week 4 Viva la Verve Sketch in the Verve forum. 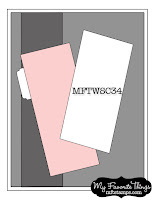 I broke out more MME papers...this time from the Vanity Fair 6x6 pad. I die cut the leafy flourish 3 times and then cut 2 of them down and arranged them in an L formation. I had a dimensional butterfly sticker that fit the colors well. The stamp is a Plain Jane Psalm 46:1 by Verve. An absolutely gorgeous day outside...sunny...slight breeze...low 80's AND I'm off work today! I'm finally getting to try out my new camera - a Canon PowerShot S95 - to photograph this card and I really love it! I used a GorillaPod to see if that would help to give me a clearer picture, plus used the macro, no flash setting. I don't use a light box. Instead, I prop up a couple of white CS sheets and take the picture in a windowless room that has a large fluorescent ceiling light. I adjust the color/brightness in GIMP when I'm adding my watermark. 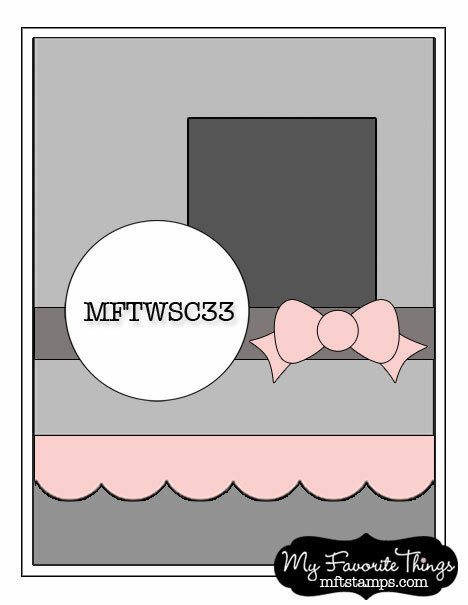 I'm just getting around to creating a card for last week's MFT Wednesday Sketch Challenge. Tweaked it a bit by using 2 ticket stamps in place of the rectangle panel. Don't forget to make a comment for a chance to win some blog candy...check out THIS POST! 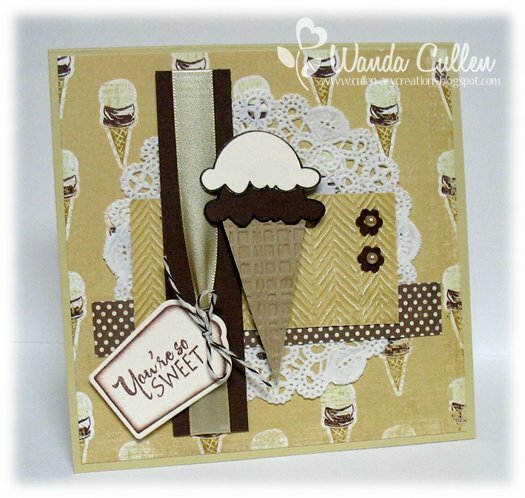 ACCESSORIES: Ticket Die-Namic (MFT), Baja Breeze seam binding, Stacking stars Die-Namic (MFT), Open Scallop border Die-Namic (MFT), Adhesive pearls, Vintage button (PTI). It's Friday and the bartenders have created some samples to help you "beat the heat" on the Raise the Bar blog! 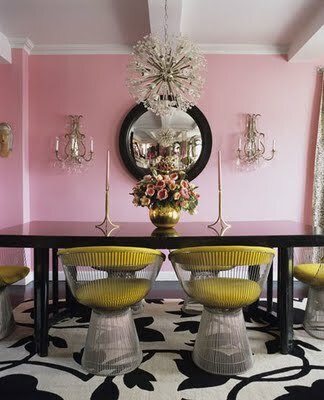 We'd love to have to play along with this fun theme! I started with this DP from MME's Paris & Co (if you'd like to enter into my blog candy offer, make a comment on THIS POST and you just might win this fabulous paper!) . 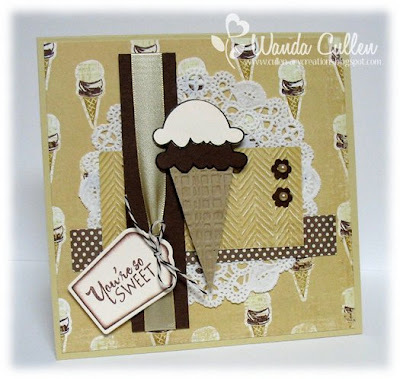 I created my cone by cutting a triangle from kraft CS and embossing it with the plaid Sizzix EF. The 2 "scoops" of ice cream are actually the top portion of Verve's cupcake image that I paper pieced. 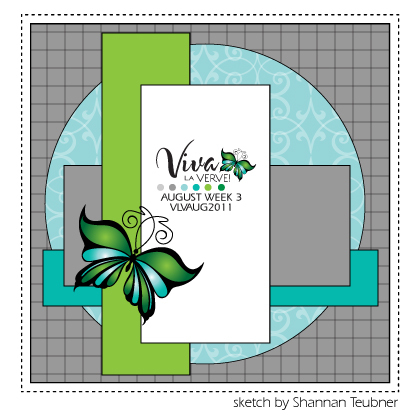 The sketch uses Shannon's awesome layout for the Viva la Verve challenge for week #3 in the Verve forum. My new Verve goodies arrived today, so the sentiment was stamped on a small tag die cut from Vintage Cream CS. ACCESSORIES: Herringbone & Plaid EFs, Small tag dies by Verve, Baker's twine, Paper doily, Fine Linen satin ribbon (PTI), Small flower punch, Pearls. My blog candy offer is still on through the end of August! Check out THIS POST and leave me a comment for a chance to win FIVE new MME 6x6 paper pads! 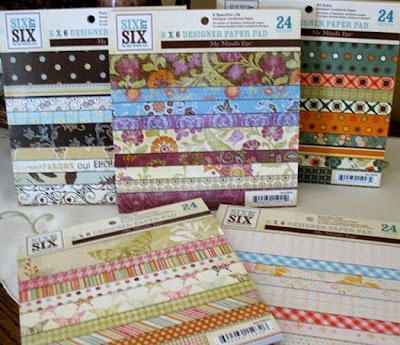 Just a reminder to comment on THIS POST for a chance to win 5 new My Mind's Eye 6x6 paper pads! 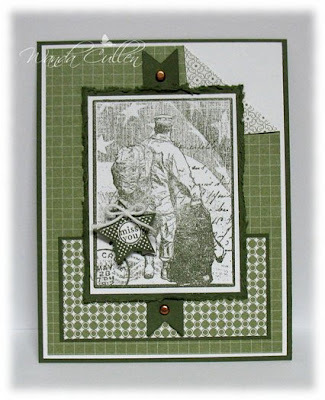 ACCESSORIES: Border punch by MS, Baker's twine, Tiny tag die (PTI), Brads. 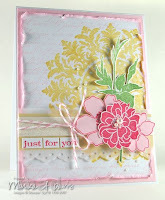 I'm trying my hand with the Moxie Fab Tuesday Trigger inspiration challenge...girly and gutsy is how Cathy describes it! 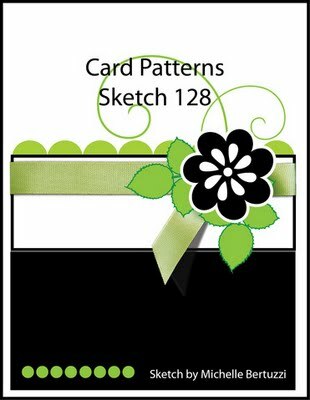 My layout is for Card Patterns Sketch Challenge. I was inspired by the colors and also the swirls and circular elements in the photo. 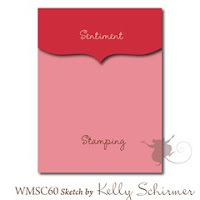 STAMPS: Say it Loud by Waltzingmouse Stamps. 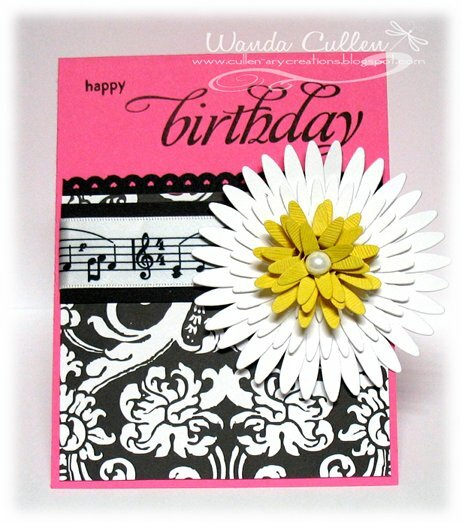 PAPER: Hibiscus Burst (PTI), Black, White, Mambi Color Basics by Me & My Big Ideas, Yellow textured paper (? source). ACCESSORIES: Border punch by MS, Ribbon, Daisy die by SU, Daisy Die-namic by MFT. 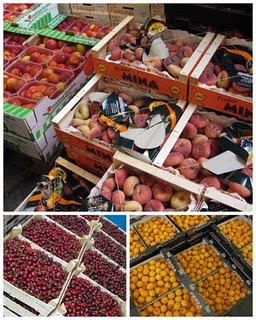 BLOG CANDY! My Goof is Your Gain! Hello to all my dear blogging friends! I have some blog candy to offer you...thanks to my mistake in duplicating orders! :-) I am so in love with My Mind's Eye designer papers in the 6x6 pad sizes and I would love to give out FIVE of these pads to a lucky blog reader who leaves a comment in this post! Summer is winding to a close and there's a hint of fall coming (shorter days for one), so I'd love to hear of a special summer memory you might have from this season. You don't have to become a follower, though I'd love to have you do so only if you're inspired by my work. Deadline for the giveaway will be August 31 up until midnight EST. I'll announce the winner on September 1. Good luck! It's a multi-tasking Monday morning...created this card for 3 challenges...chatting in the Dirty Dozen thread with lots of excitement as the 2 new dirty girls await their big reveal...watching the Nascar rain-delayed race in the BG...hitting the laundry room...Soon my vacation week ends as I head back to work this afternoon. 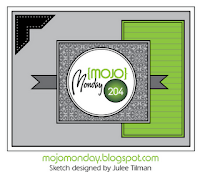 So, back to my card...It's for the Mojo Monday sketch challenge (I flipped it), for the Crazy 4 Challenges monochromatic theme and for ODBD Shining Light Challenge to add a tag (I used a tiny star tag). STAMPS: Not Forgotten by ODBD, Tiny Tags by PTI. ACCESSORIES: Tiny tag die (PTI), Sentiment flag die, Copper brads, Distressing tool. The featured stamper on SCS is Penny (aka pawallen142) and she's got a wonderful gallery! 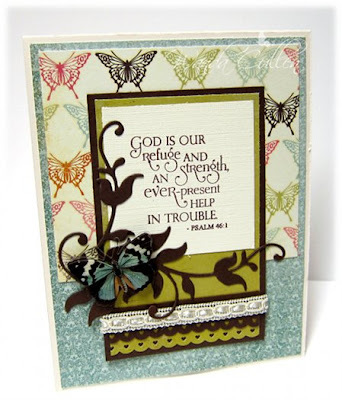 I chose this card to CASE...changing the image, the DP and adding a sentiment. I liked the clean lines she used and really liked the layout! I stamped multiple images from SU's new Button Buddies set when our stamp club last met. I was on the fence about buying this set, so thought I'd "try" it out first! I'm also entering this into Our Creative Corner's Challenge to use fruit on a card. ACCESSORIES: Vintage buttons by PTI. ...to Claire for her generous offer to give away a free set for a lucky participant of the weekly Waltzingmouse Sketch Challenge! My name was drawn several weeks ago, and I chose this Say it Loud set that has an endless variety of possible sentiment combinations. Kelly has another great sketch for us...very CAS but can be dressed up or down. I kept my card simple, so I wouldn't cover up these beautiful new papers from MME's Six by Six collection called Paris & Co. 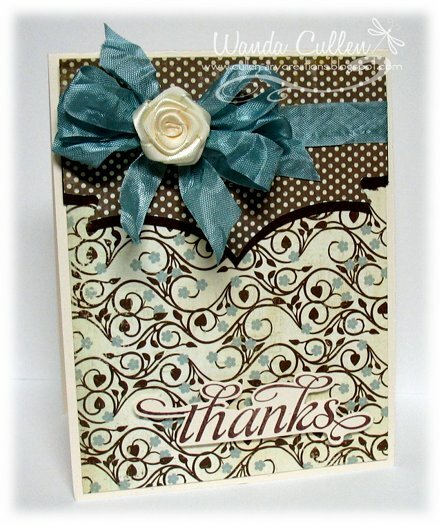 The decorative edge was made using Tim Holtz' Ornate die - once cut using Chocolate Chip and again cut using the dotted swiss DP. I am so sad that my supply of these vanilla rosettes by SU is nearing the end! They are no longer in the catalog and my search online was a dead end. If anyone knows where I can buy more of these satin roses, please let me know! 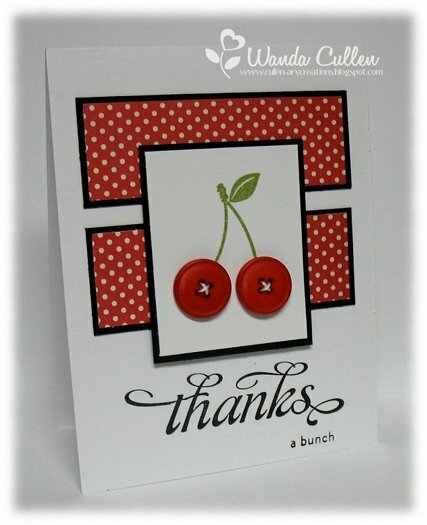 Thanks for stopping by and commenting...I always love to hear from you! Ways to Use It - What's Hot? (use images of heat or technique that uses heat). I used a heat gun to melt the white EP on the butterfly. Eclectic Paperie Challenge - use distress stains (Tim Holtz Cracked Paint stain used on the doily), die (leaves and flower dies used), & egg carton (flower petals were die cut from a white egg carton). Friday Mashup - Butterflies, Bling and the colors Marina Mist, Perfect Plum & 1 more color of our choice (I chose green) with one neutral (white). Case Study Challenge - case a challenge player (I cased Monika - see her lovely card posted below). 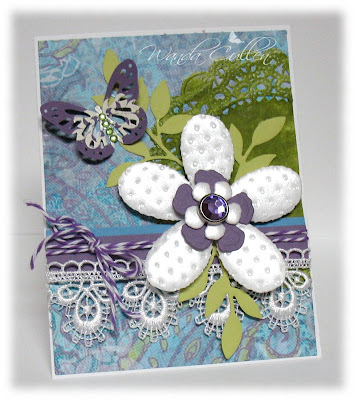 ACCESSORIES: Paper doily, Lace, Baker's twine, Gemstone brad, Rhinestones, Butterfly punch by MS, White EP, Little Leaves Sizzlit die by SU, Dotted swiss EF. Raise the Bar is BAAACK!